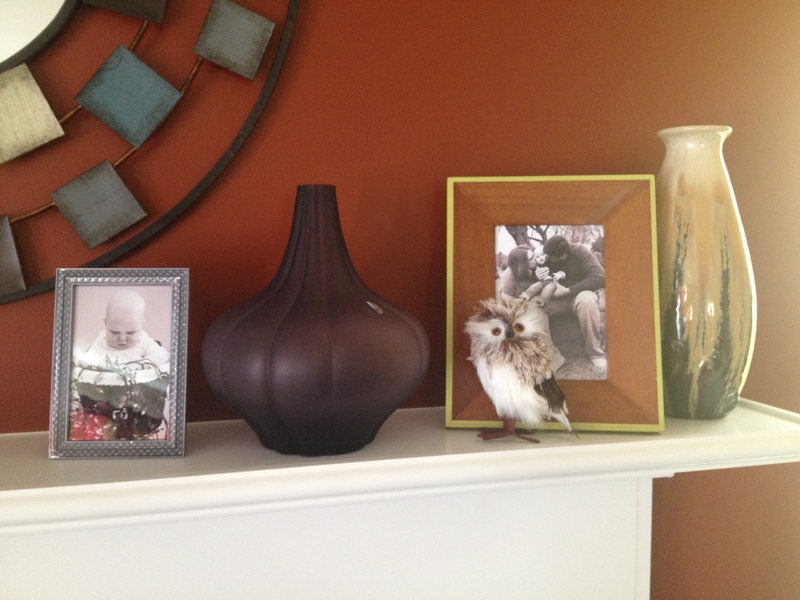 I have been trying to find some new and interesting ways to decorate my mantel without breaking the bank. It would be ideal to find something for each season rather than each holiday worth decorating for (Christmas, Valentines, Easter, July 4th, etc.). How do you decorate your mantel? Do you change it for each holiday? Do you leave it the same year after year? Or are you so exciting that you redecorate every week??? As you can see, I try to definitely include as many pictures of Fisher as I can. 😉 Most of the other items were gifted to me. Are the wooden branchy things even in style anymore? I believe I purchased the red vase from Goodwill about 8 years ago; the purple vase was a gift from my in-laws; and the tan/green swirly vase was a gift from my BFF (Dana). The owl was a gift from Nate’s aunt for Christmas. She always comes up with really interested and eclectic gifts. 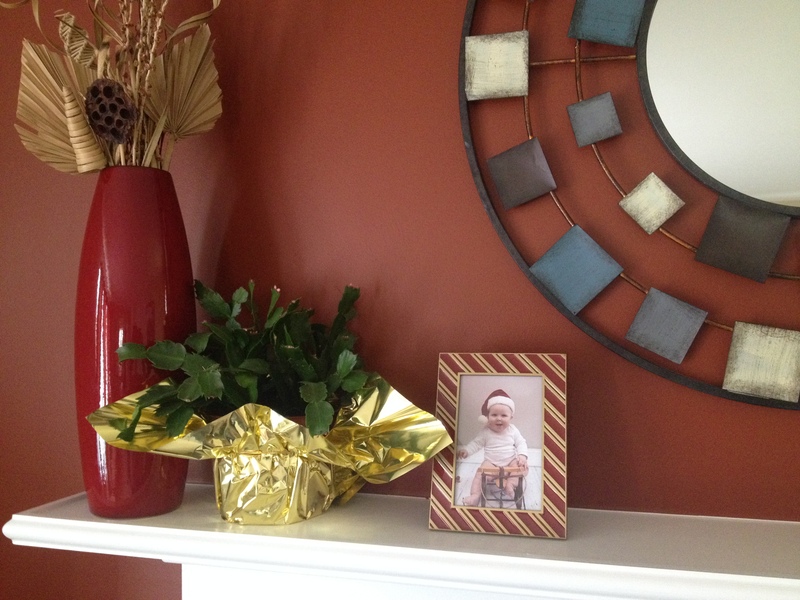 The Christmas cactus was from my mother-in-law. I mentioned to her that I would love to have a piece from hers to start my own and she went and bought me a whole plant! I love those when they bloom (not to mention they are super easy to care for). The mirror above the mantel was purchased from Kohl’s. I had it in our previous home on a main wall of our living area. I really love the way it pops with warm colors. I am a warm-color-kind-of-girl! The various pictures frames were from Target (probably on clearance!). 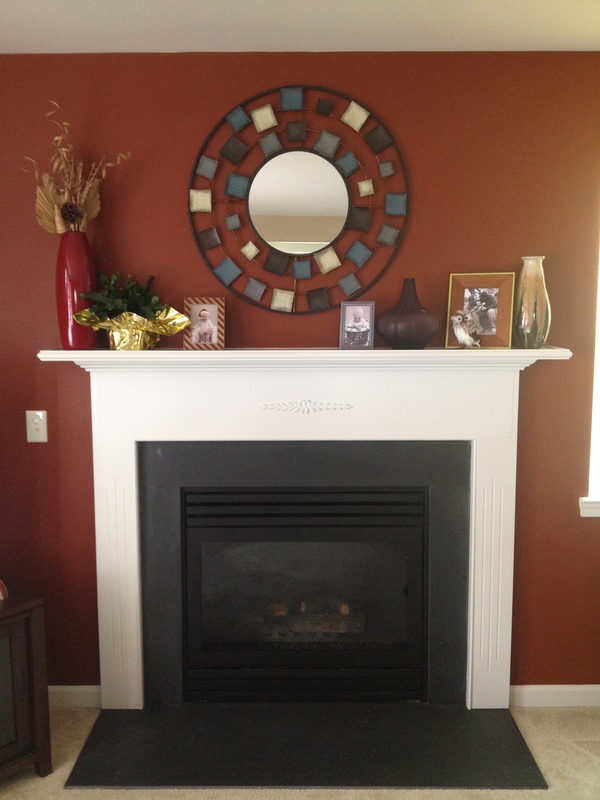 One last thought…painting a fireplace surround – yay or nay? Would you leave it white? I kind of like how the white makes it pop, but sometimes I wonder if we should have painted it a color to go with the mirror above the mantel or another color in our living room. What are you opinions of my mantel? I would love to hear what improvements you suggest. If I end up making any changes I will definitely do an update. Can’t wait to hear what you think I should do! « Someone Has 6 Teeth!? !